I am a firm believer that a cluttered room creates a cluttered mind, but life is clutter. Sometimes we need to put in a little extra effort to reestablish order and restore our clarity of mind. Continuing my blitz across my home, I return to the closet mess today. This is a task that tests my resolve. It's messy, complicated, and I'd rather have my nose surgically rotated without anesthesia. Yet, it's important and somebody's got to do it. Yay, me. What drives me is my firm belief that my life will be better when I'm finished. Certainly, there are hidden and vital treasures hiding in this last box, too. It's up to me to quickly burn through the pile and finish before distraction settles in. A difficult task to be sure when one's six and eight year olds leap upon every unearthed goodie as something they have never seen before in their life because sadly, they truly haven't. I usually like to discuss esoteric matters like how Depression is depressing and how AD/HD tends to keep me distracted, not go into details about how I clean out my sock drawer, but clearing away clutter is one of the powerful tools I have for fending off Depression and keeping my thoughts in order. However, when you consider how many people I know who are either suffering from Depression or AD/HD and who live entombed in their own clutter I began to feel that perhaps this was a more important topic than I gave it credit. 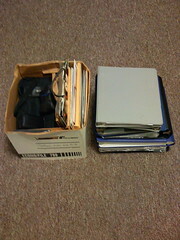 there must be an easier way - prob is my first option is always to throw things out. and that cannot always work. Well, my friend, I hate to disagree with you but throwing things out is usually the best method. Not only can it be liberating, but what other choice do you have? If you haven't dealt with the mess in years, can't deal with the mess, and hate how the mess mocks you, taunts you, and calls you mean names whenever you pass by it, you can either roll up your sleeves and force yourself to prune the beast or just chuck it in the bin. A precious photo crumpled under an old program book and packed away with the Christmas cards and old phone bills from 1994 isn't really so precious, is it? It's trash. Here's how I tackled my mess. 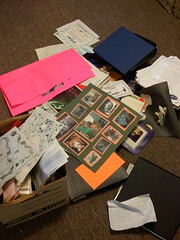 I first sorted papers into like sized piles, moved photos into their own pile, pushed the photo albums aside into their own pile, and moved everything else I had no idea about into it's own new pile. I pruned obvious junk into trash and recyclables as I went along. I also fended my kids off with a big stick, especially my six year old who liked to collapse piles and spread them around with her body on her way across them to grab at something. Once everything was sorted, I repacked all the like sized piles into the box and turned to face the "what the heck will I do with this junk" pile. It wasn't as bad as I thought it would be. I just junked a lot of it and tucked the keepers into the box. Ta da! Tomorrow I'm definitely tackling something smaller. Perhaps the northwest corner of the town dump might be easier to handle. Join me each day and comment here when you finish. Spread the word. Let's get a whole bunch of us filling up landfills across the world*. The trick is to pick a small pile that can be polished off in one quick session. Most of my readers are dealing with Depression, AD/HD, or both so beginning yet another unfinished project brings a lot of emotional baggage. Start small and congratulate yourself on success. Know your limits, but push to expand them, and always remember "When in doubt, throw it out."